Traditional leaders said they were hoping to meet ANC leadership over several issues, including their concerns over the party's failure to honour some of its past elections promises. 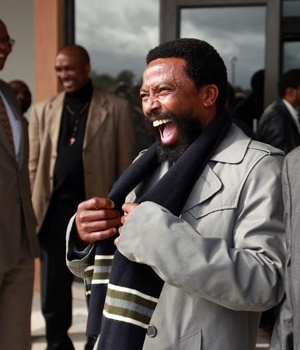 The Congress of Traditional Leaders of South Africa (Contralesa) said it will also ask the ANC and President Cyril Ramaphosa to release AbaThembu King Buyelekhaya Dalindyebo from prison. In 2009, the Eastern Cape High Court sentenced Dalindyebo in effect to 15 years in jail for seven counts of kidnapping, three of assault, three of arson, and one each of defeating the ends of justice, culpable homicide, and defeating the ends of justice. The Supreme Court of Appeals shaved off three years of his sentence in 2015. He started serving his sentence in December of that year. A decision to meet the ANC was taken at Contralesa's national executive committee (NEC) special meeting held on Saturday where "matters of national importance" were discussed, Contralesa general secretary, Zolani Mkiva, said in a statement. "The NEC further resolved to demand an urgent meeting with President Cyril Ramaphosa and the ANC leadership to address a myriad of promises that the ANC had committed to honour prior to the elections." Asked to clarify this on Sunday, Mkiva said a "joint task team established last year between Contralesa and the ANC to look into fundamental issues that relates to rural communities and this would be primarily around issues of service delivery". "The government gets to focus on infrastructure development in urban areas while in rural communities roads are in bad state…we must not just continue to maintain infrastructure in urban areas but invest in new infrastructure in rural communities to prevent unintended urbanisation, attract growth and development and attract investments in rural areas," Mkiva said. He said among their list of 30 issues to be discussed with the governing party, will be their undying demand for the restoration of powers of traditional leaders which he said have been moved to municipalities. He said councilors now hold the power and this was "creating chaos because no one knows who the real sheriff in town is". Mkiva said contact was made with the Presidency and the ANC adding that they were hoping the meeting will go ahead by the end of this week. Calls for comment to the ANC and Presidency went unanswered on Sunday.